The book received a small grant from the Coleg Cymraeg Cenedlaethol to Bangor University’s Language Technologies Unit at Canolfan Bedwyr, and includes seven chapters on the context of translation in Wales today, language registers in Welsh, theory and practice, translation technology, and useful resources such as terminology dictionaries. The editors are Delyth Prys and Robat Trefor, who have also contributed chapters, the other contributors being Tegau Andrews, Gruffudd Prys and Mared Roberts, who are also members of the LTU, Sylvia Prys Jones, the Head of Bangor University’s Translation Unit, and Heini Gruffudd, an expert on Translation who lives in Swansea. Delyth Prys said “Considering the importance of the translation industry in Wales today, it is remarkable how little has been written in Welsh for translators and translation students. We therefore decided to try and remedy this ourselves, since we have all lectured and led workshops in this field. 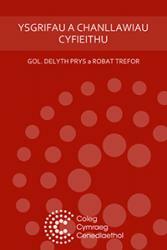 The volume is available only in e-book format, and may be downloaded free of charge from the Coleg Cymraeg’s Resource Library.